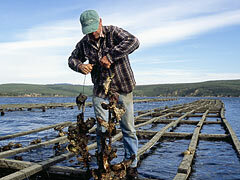 Oyster clusters are raised on wires, known as "strings", submerged into Drakes Estero. Drake’s Bay Oyster Company's growing area has the finest water quality of any growing area in the state of California, period. These waters contain the only approved growing waters in the state of California. This approved growing area is the only one in the state that is never closed due to potential pathogen spikes following rainfall events. Decades of water sampling have proven this is one of the safest shellfish growing waters on the North American Continent. A deep-water upwelling just off the coast of Drakes Bay provides cool, nutrient- rich water year-round to Drake’s Estero. This clean, nutrient-rich water produces what are recognized as some of the finest oysters in the world. In California, Drake’s Bay Oyster Company is the only commercial oyster producer that performs its own remote seed setting. 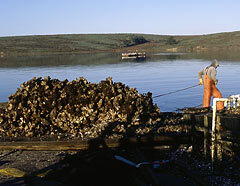 Remote setting allows the company to produce its own oyster seed (baby oysters) on site. Farm worker moving the day's catch to shore. Currently, the shellfish species produced in the Drake’s Estero include Pacific Oysters and Manila Clams. These shellfish continue to be produced as "singles" and are sold live in-shell as well as shucked and packed in various sized containers.